MTV VMA 'Who Wore It Best?' Celebrity Puppies vs. Taylor Swift, Kanye, Beyonce And More! The 2016 MTV Video Music Awards are just around the corner and that means over-the-top outfits, memorable performances and more! As a way to celebrate, polling app Wishbone has partnered with DogVacay to recreate 10 of MTV VMA's hottest ensembles and moments from the past few years! We've enlisted celebrity puppies and put them up against the A-listers themselves including big timers like Taylor Swift, Justin Bieber, Kanye and more! Now it's the fans chance to vote: Who Wore it/Did it Best? Lady Gaga brought out the big guns during the 2010 VMAs by shocking everyone with her iconic raw meat dress - with matching boots and all - which was meant as a statement piece against the government restrictions placed on the rights of gay soldiers. There hasn't been anything "meatier" on the red carpet since -- until now. Who wore this yummy look best? Katy Perry borrowed this all-denim look from a little known celeb named Britney Spears and decided to throw in a little twist to her 2014 MTV VMA look. She stated she "remixed" the look by adding studs, a bold red lip and striking black locks. Now, we have celeb puppy Katy Furry taking a stab at "remixing" this classic herself. Now we ask: who wore this look best? Queen B vs. Queen D? The one and only Queen B, aka Beyonce, nearly broke the Internet when she surprised us all by announcing her pregnancy during her live 2011 VMA performance of 'Love on Top.' Her puppy celebrity counterpart Queen D now has a surprise red carpet announcement of her own: she may or may not be pregnant herself. Drama! Which Queen will break the Internet this time? The Kardashian/Jenner's vs. The Dogashian/Fetcher's? Kendall, Kim and Kylie look fierce on the VMA red carpet sporting one of their favorite designers, Balmain. But look who's trying to keep up with the Kardashian/Jenner's? Make way for the Dogashian/Fetcher's! These "it" pups are aiming to steal the Balmain look from right under the sister's noses. Can they do it?! Will it be too late to say sorry when The Pups beats out The Biebs? Justin Bieber may have rocked the leather jacket and long blonde locks at the 2015 VMAs but celeb puppy 'The Pups' is right at his heels bringing the look back to this year's red carpet. Who pulled this look off best? Jenny from the Block vs. Jenny from the Dog Park? Jennifer Lopez, aka Jenny from the Block, made VMA history by wearing this all-white, hip-hop ensemble to the 2000 MTV VMAs alongside her then-beau P.Diddy. Today, Jenny from the Dog Park is now coming onto the scene making her presence known with her own white-ensemble. Who wins this battle of the Jennys? In 2003, popstar Christina Aguilera, aka X-Tina, decided to fluff up the red carpet with this fun and pink feather dress - a real eye catcher! Puppy celebrity D-Stina is now also turning heads with her own version of the dress, and this year, she's adding her own twist and striking a killer pose for the cameras. Which entertaining diva wins this battle? Miley Cyrus & Robin Thicke vs. Miley Canine & Robin Lick? Who can forget Miley Cyrus & Robin Thick's cringe-worthy, history-making 2013 VMA performance of 'Blurred Lines?' We all can't forget it but we want to unsee it! 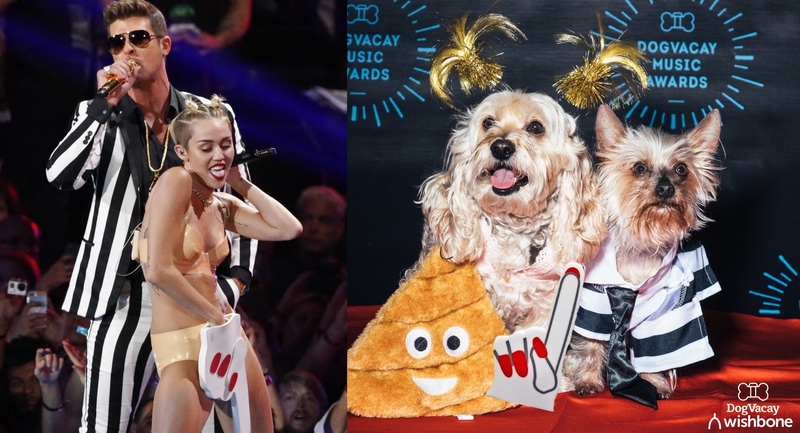 Puppy celebrities Miley Canine & Robin Lick are opting for a classier award-show moment and pose for the cameras in matching stripped tux, mini-buns and all. Who wins this battle? Brit Spears stunned crowds by welcoming an extremely large yellow python to the stage at her 2001 VMA performance of 'Slave 4 You.' That is exactly the reaction her puppy celebrity counterpart Brit Shaggy is aiming for when bringing her own snake prop to her red carpet debut. Both are bold moves but which will take the cake? Kanye & Tay Tay vs. K-Dawg & T-Dawg? This memorable 2009 MTV VMA moment is one that was heard around the world -- also was one that caused an 8-year feud. Kanye West interrupted Taylor Swift's award speech by rushing the stage, stealing her mic and turning the limelight onto Beyonce, an artist who he felt deserved to win the award over Taylor. Fast-forward to 2016, celebrity pups K-Dawg & T-Dawg are taking the highroad and coming together for a friendly red carpet pose in nearly identical outfits to the real Kanye & Taylor. Who has the best look of ALL TIME in this battle?